Commercial building is growing at an accelerating rate across the UK with public commercial work leading the way, according to Savills latest commercial development survey. Total commercial sector growth was at a record high in November despite a slowdown in the rate of growth in private commercial building. Eight out of nine sectors of development work recorded growth, with the exception being public retail and leisure. Private new build was the fastest growing sector. The industrial and warehouse sector was the second fastest growing as activity continues to pick up for sheds and factories. The Total Commercial Activity Index, which indicates the overall performance of the UK property sector, reached a peak of +34.5%, up from October’s +30.2%. The survey shows broad based growth nationwide, with the strongest growth seen in the ‘Rest of UK’, which at +44% was a record for the survey, which is now in its tenth year. 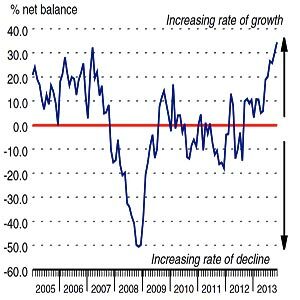 The net balances for the other two survey areas – ‘London’ and the ‘South East’ – also indicated robust growth. Those surveyed cited improved client confidence, increased availability of finance and improving economic forecasts as reasons for the improvement in performance and optimism on the future outlook. The net balance for the three month outlook for commercial activity rose to +27.1%, its highest since an eight and a half year peak of +27.7% in August. The report is compiled for Savills by Markit Economics using a monthly questionnaire to a panel of leading developers and contractors. Results show the percentage of respondents reporting an improvement, deterioration or no change since the previous month.